Join us as we celebrate 60 years of legal service to Wendell and Raleigh. The team at Kirk, Kirk, Howell, Cutler & Thomas, LLP offer insight to some of the great history of the firm from the years. Sixty years ago this year, Clarence M. Kirk, fresh out of Wake Forest College (now University) Law School, started a law firm that eventually grew to become Kirk, Kirk, Howell, Cutler & Thomas. Mr. Kirk embarked on building his new law firm based upon principles he learned as one of eleven children who grew up on a tobacco farm in eastern Wake County. Among those principles was the notion that results and rewards don’t come without hard work and commitment. His humble beginnings also reinforced an understanding that every client he represented, from field hand to business man, deserved respect, empathy, and the benefit of the equal justice under the law. Today, every lawyer at Kirk, Kirk, Howell, Cutler & Thomas practices law with all of those same principles in mind. In the spring of 1957, Clarence Kirk had just graduated law school. Mr. Kirk actually started his law school education at the original Wake Forest College campus located in Wake Forest, North Carolina. He held the unusual distinction of having attended the school in both that small town and then in the school’s later home in Winston-Salem. Mr. Kirk was eager to return to his rural roots. 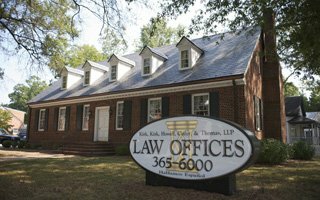 So following his law school graduation, Mr. Kirk, instead of going with other firms, came back to his home in Wendell and founded what would be become one of the most prominent law firms in eastern Wake County. Mr. Kirk would practice in the town of Wendell up until his death in 2004, bringing to a close an accomplished 47 year legal career. Mr. Kirk’s legal profession began even before he went to law school. At the young age of twenty-eight, he became a judge and served on the bench for 14 years at the Wendell Courthouse. At that time, the local courts were known as “Recorder’s Court,” much later becoming the “District Courts” in 1968. He was passionate about the judicial system and this passion is what led him to become an attorney. After becoming a licensed attorney at the age of 32, he opened his own law firm in Wendell, North Carolina in 1957. At the time, a small space just above the historical storefront of Strickland’s Jewelry on First Street, housed his practice. He was a sole practitioner until 1969, working diligently to meet and serve the needs of the great people of Wendell and surrounding towns. Mr. Kirk’s name quickly spread and as his own personal fame grew, so did his practice. In 1975, Mr. Kirk expanded the firm and moved it into the building it sits in today – at the corner of Pine Street and Wendell Boulevard. The firm is modeled after a historic brick colonial, that of George Washington’s birthplace actually. While it has the characteristics of old home charm, Mr. Kirk specifically constructed it from the ground up with offices on each floor. Today, with attorneys and staff filling every office, the office still boasts a welcoming and confident feel to all its guests. Philip G. Kirk, son of Clarence Kirk, joined his father in the practice in 1984. Joseph T. Howell came on the following year in 1985 after serving as a judicial clerk following law school. Philip and Joe went to law school together at North Carolina Central University School of Law. In 1989, fresh out of Campbell Law School, Jeffrey M. Cutler joined the firm and a few years later, in 1994, Clarence Kirk recruited Terrell Thomas from Wake Forest University School of Law. Over the years these attorneys, now named partners, evolved into their own dedicated practice areas, enlarging the services the firm could offer their clients. Today, as the firm reflects on the past 60 years and the growth of its practice, one thing remains the same – the firm is still client oriented. It is this client focus that has brought clients back time and time again for all their legal needs. “It is very rewarding to be practicing with a firm so devoted. Our clients are our first priority, and we want to be accessible to them when they need us,” said associate attorney Candace Seagroves. Candace began her legal career at the firm when she was only sixteen, first as a runner and then after college becoming a paralegal. She later obtained her law degree and the firm was thrilled to have her on as an attorney. “This firm is like my second family. Mr. Kirk was a true example of zealous advocacy and compassionate service. Working alongside this great group of attorneys is a real pleasure and something I admire most about our practice is a shared care for our clients,” Candace said. Without a doubt the practice of law has changed over the past 60 years. However, one thing that Kirk, Kirk, Howell, Cutler & Thomas prides themselves in preserving about their practice is their commitment to their clients. “It has been a real honor to gain the trust of our clients in this great town of Wendell and across our state. As our firm prepares to enter year 61, we do so humbly recognizing that clients have a choice in who they have as their lawyer and we are grateful that our clients choose us,” said Joe Howell. Over the years, our firm has grown and undergone changes, but we still serve the residents of North Carolina with unparalleled commitment. Each case offers unique challenges, but due to the experience of Kirk, Kirk, Howell, Cutler and Thomas, our clients know they are receiving quality legal representation. If you are in need of legal assistance, our Raleigh and Wendell attorneys are ready to serve you. 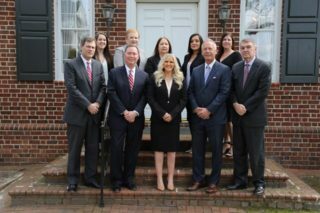 Give our team a call or complete the online contact form, and you can receive the excellent legal service that the residents of North Carolina have received for 60 years!